It is the dawn of the third age of mankind, the middle of the twenty-third century. Man is far from alone in the universe. A hundred years ago, humanity made contact with its first alien civilization -- or more to the point, they made contact with us. Before the arrival of the Centauri, we were confined to our own solar system, forced to use slow sleeper ships to explore the universe. The Centauri gave us the stars, offered us the use of their "jumpgates" -- portals into hyperspace -- and later, taught us to make our own. In exchange for this and other technologies, they asked only for trinkets, novelties to sell back home. In the eighty years that followed, humanity flexed its muscles, expanding outward at a rapid pace. When a group of less powerful races was attacked by an invading army, Earth came to their aid, cementing its role as a major galactic power, if a young, brash one. The wave of euphoria came crashing down when humanity made contact with a mysterious race called the Minbari. The earth-minbari war began with a misunderstanding, a human captain and a Minbari commander too quick on the trigger. Thanks to bad luck or something darker, our first meeting with the Minbari resulted in the death of their supreme religious and political leader. To the Minbari, what followed was a holy war, vengeance for the murder of their spiritual leader. Earth was no match for the technologically superior Minbari, and they easily beat us back to our home planet. Then, without explanation, as their ships closed in on Earth and wiped out our last desperate defenses, the Minbari halted their advance and surrendered. Only an elite few knew why. The Babylon Project was conceived in the aftermath of the war. Modeled after the United Nations, it would be a meeting place, neutral ground where the powers could meet and work out their differences peacefully. The first three Babylon stations were sabotaged in mid-construction. The fourth was completed, but just as it was about to go online, it vanished without a trace. The Earth government would have stopped there, but some of the alien governments, seeing the value of a meeting ground, offered financial assistance for the construction of a fifth station. Naturally, there were strings attached. 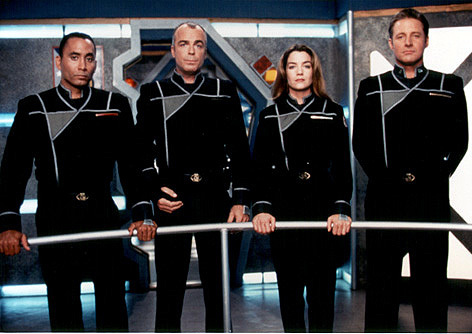 "Babylon 5," the Babylon 5 logo, all publicity photos and images from the series are copyright © and trademark  1992-1998, PTN Consortium and Warner Bros.